This NASA graphic offers an introduction to the constellations visible in the Northern Hemisphere. 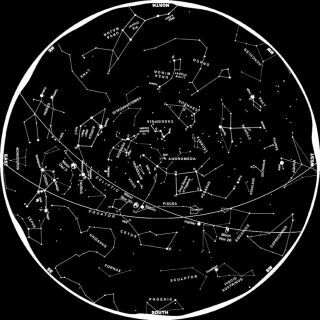 There are 88 officially recognized constellations in the sky, and these astronomical patterns have a fascinating and long history. Forty-eight of the constellations are known as ancient or original, meaning they were talked about by the Greeks and probably by the Babylonians and still earlier peoples. After the 15th century, with the age of the great discoveries and worldwide navigation, the southernmost parts of the sky became known to man and had to be charted. Furthermore, across the entire sky were large gaps filled chiefly with dim stars between them. In more recent times people have invented the modern constellations to fill up some of these spaces. In our current evening sky, roughly between the bright star Capella and the Big Dipper’s bowl are two examples of modern constellations. The first is the “camel-leopard,” Camelopardalis, which in Latin means giraffe. The other is the Lynx, one of only two animal constellations with identical Latin and English names (the other is Phoenix). This celestial feline is rather dim and hard to visualize. Johannes Hevelius (1611-1687) a 17th century Renaissance man placed it in the sky. Aside from being an astronomer, Hevelius was an artist, engraver, well-to-do man of affairs and a leading citizen of Danzig, Poland. Interestingly, the old astronomy books and sky charts, which depicted the constellations as allegorical drawings, placed the lucida (brightest star) of Lynx in the tuft of its tail. From these drawings it would seem that nearby Leo Minor, the Smaller Lion, is about to provoke a cat fight by biting Lynx’s tail! In creating Lynx, Hevelius chose a cat-like animal that possesses excellent eyesight. Lynx itself is a region chiefly devoid of bright stars, and Hevelius openly admitted that you would have to have the eyes of a lynx to see it. Another faint star pattern now no longer recognized is Felis, the Cat, which was the creation of an 18th century Frenchman, Joseph Jerome Le Francais de Lalande (1732-1807). Although this celestial feline does not exist today, cat fanciers will be consoled by the fact that there are three other members of the cat family — Leo (the Lion), Leo Minor (the Smaller Lion) and Lynx — that are well situated and close together in our current evening sky. I’ve always wondered if Felis might have later inspired New Jersey cartoonist Otto Messmer to create a curious, mischievous and inventive little character known as Felix, the Cat. Nicolas-Louis de Lacaille (1713-1762) is considered a pioneer in astronomy. Between 1751 and 1753, this modest, but hardworking French astronomer was stationed at the Cape of Good Hope in South Africa, where he catalogued the positions of 9,766 southern stars in just 11 months. He is perhaps best remembered today, however, for inventing 14 constellations that he added to the southern sky. Although they are all still officially recognized today, they are composed mostly of very faint stars, which formed patterns that generally are dim and pointless. Unlike many of the larger, brighter constellations, which were chiefly based on mythology and legend, Lacaille chose to honor inanimate objects. This NASA graphic offers an introduction to the constellations visible in the Southern Hemisphere. One of these is in our current evening sky: Antlia Pneumatica, the Air Pump, which was created by Lacaille around the year 1750. Despite being composed chiefly of dim, faint stars, it is still officially recognized to this day as a constellation, though its name has since been shortened simply to Antlia, the Pump. Just above the Pump was Felis, the Cat, which is no longer recognized. Lacaille’s other constellations included a Sculptor’s Chisels (Caela Sculptoris), The Compasses (Circinus), a Chemical Furnace (Fornax Chemica), a Pendulum Clock (Horologium), a Carpenter’s Square (Norma), Hadley’s Octant (Octans Hadleianus), a Painter’s Easel (Equuleus Pictoris), a Mariner’s Compass (Pyxis Nautica), a Rhomboidal Net (Reticulum Rhomboidalis), a Sculptor’s Workshop (Apparatus Sculptoris), a Microscope (Microscopium), a Telescope (Telescopium) and lastly, Table Mountain (Mons Mensae), which overlooked Lacaille’s observatory.